I had a wonderful photo session with Nycirkuskollektivet Glädje (The Contemporary Circus Collective Joy) yesterday evening. 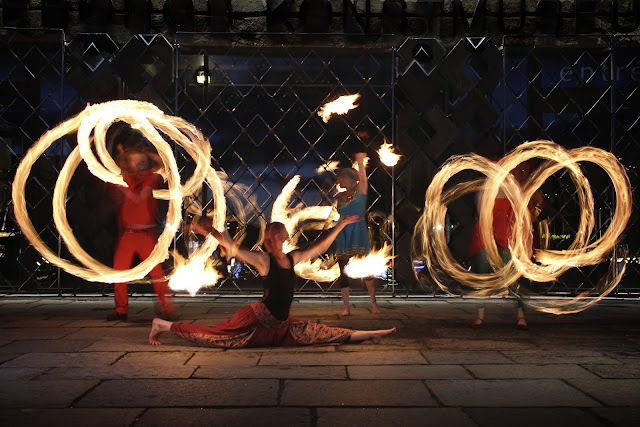 The group does fire dancing, acrobatics, juggling, dance, clowning, and magic. 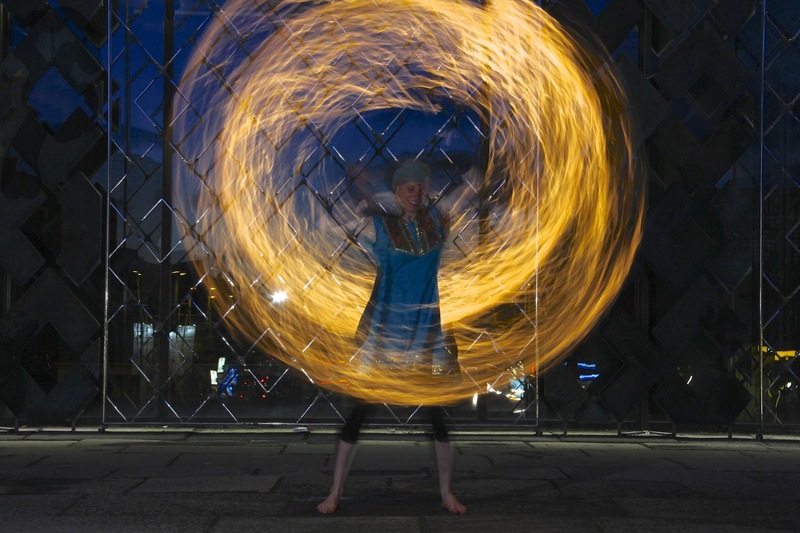 Photographing fire dancers is a bit of a challenge. If you want those gorgeous fire trails, you need exposure times of about 2-4 seconds. You can't raise ISO too high, or the pictures will get very noisy. I kept ISO in the 100-200 range for the entire shoot. 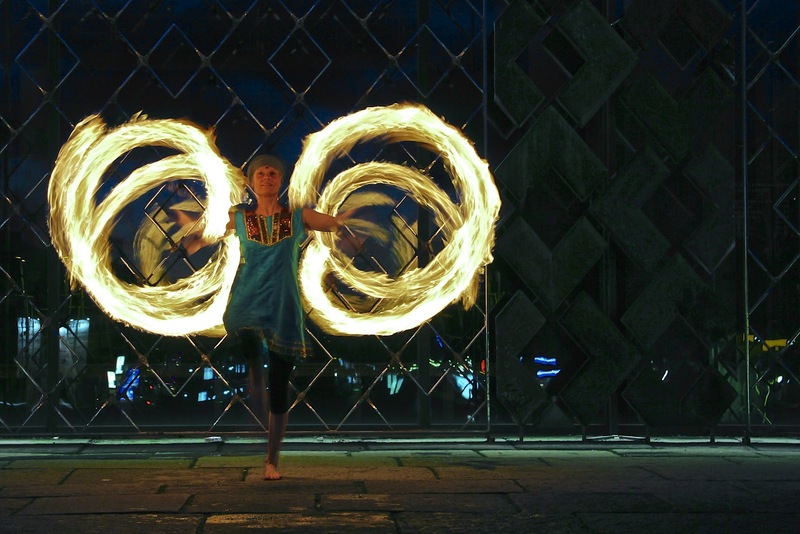 I used two remote controlled flashes mounted on light stands to illuminate the fire dancers. This helped make them visible. 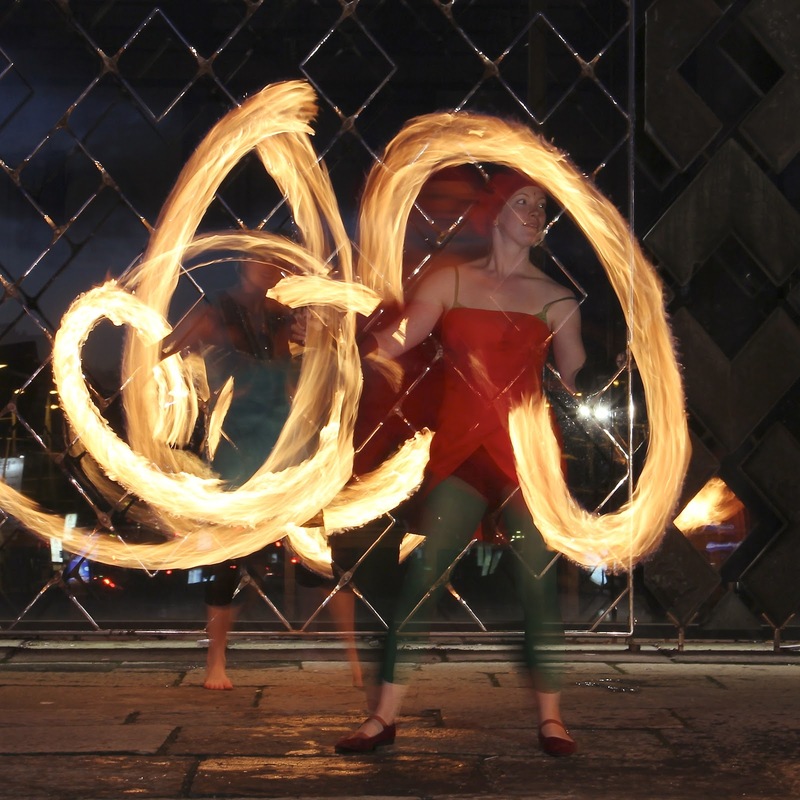 There was too much ambient light to make the performers entirely sharp. I did not use soft boxes or umbrellas. However, I put 1/2 CTO (Color Temperature Orange) gels on the flashes to warm the light. I wanted the light from the flashes to be close in color to the light from the fire. At one point, Anna asked me if I wanted lots of fire. I said yes, and lots of fire I got. The exposure time for the photo above is only 0.8s at f16 and ISO 200. A flash has very short duration, much shorter than the camera shutter time. Therefore, the shutter time does not affect how much light you get from the flash. The shutter time does affect how much ambient light you get. The aperture also affects the amount of ambient light. When you shoot at f16, the aperture, or hole through which light travels, is very small. This reduces ambient light. Thus, the ratio of light from the flash compared to light from the environment, is rather high. This makes the flash more effective at freezing the subject in the photo. I must admit, after last night, I definitely want to shoot more fire dancing. I had great fun, with some great people.